KSL NewsRadio 1160: “Five Utah police agencies will be participating in a state-sponsored crackdown on motorists who aren’t sharing the roads with bicycles. What a great idea! What are the chances of it happening in Darlington, do we think? 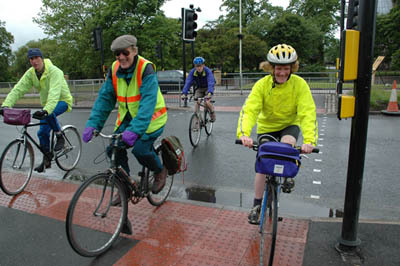 I just stumbled across the following story (updated: May 26 2005) on the Sustrans site. Five brave souls from Darlington Cycling Campaign braved the rain in June to explore the cycle routes of east Darlington. Fair weather cycling it was not! Please leave your comments about the route here, or at the Cycling Campaign flickr page, where you can see more photos of the day. The group agreed to organise rides on the second Sunday of each summer month meeting at 2pm in the Market Place, starting 12th June. On this date, Anthony Millet will organise/lead rides along the cycle routes in the south east of the town, South Park, Eastbourne etc. I think we were planning on being out for two hours. It might be good if people can bring digital cameras, and possible paper and pens, so we can document the good, the bad and the ugly. I’ll be the guy on the singlespeed Kona.